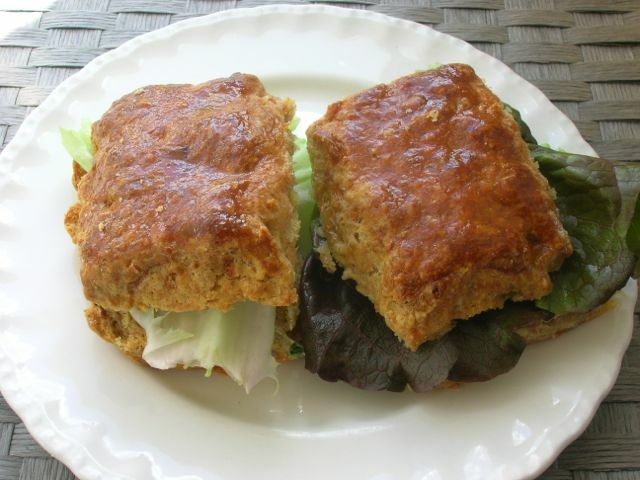 I was innocently having a quick catch-up on Facebook before getting down to the more serious business of writing up a recipe, when I noticed a scone post from Johanna, at Green Gourmet Giraffe. She alerted me to the fact it was International Scone Week. Well really, I couldn’t let another year go by without marking the occasion. 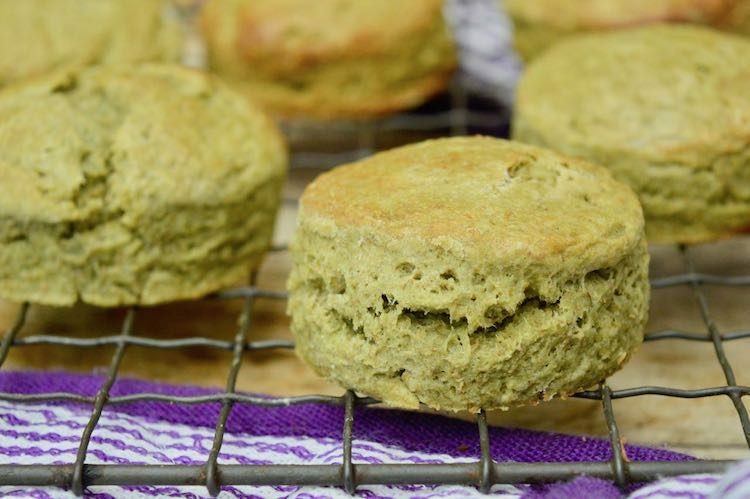 The post I was going to write has now been put on hold so that I can get the the recipe for spelt scones with health giving kefir, matcha green tea & honey published before it’s too late. As the old saying goes: here today, scone tomorrow. CT recently returned from a trip to York. Whilst there he popped into Bettys Tea Rooms for a cuppa and a curd tart. 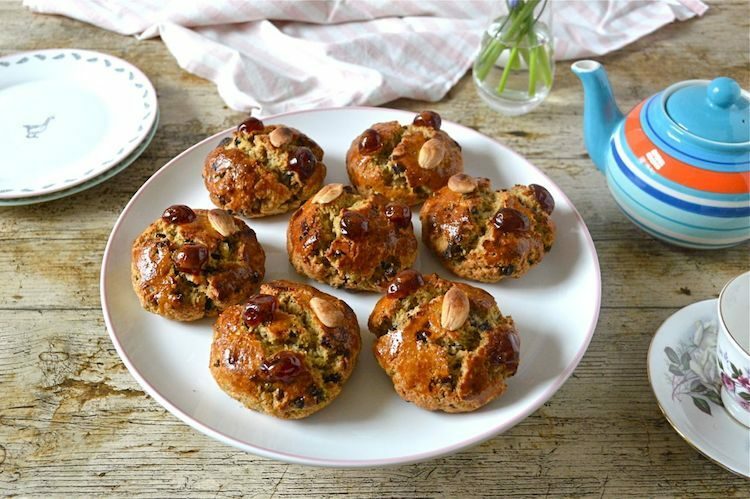 Fat rascals are a classic Yorkshire bake and one that I very much associate with Bettys. I’ve never actually tried one, so in order not to feel left out, I decided to have a go at making some. I’ve borrowed another inspiring book out of the library recently. The Violet Bakery Cookbook by Claire Ptak. It is so up my street, I want to make pretty much everything in it. I may just have to splash out and buy it. The recipes all look and sound as though you want to dive straight in, but they mostly have a healthy twist of some kind. It’s International Scone Week over at Fig Jam and Lime Cordial. Now in it’s fifth year, I’m quite shocked to find that I haven’t participated since 2012. 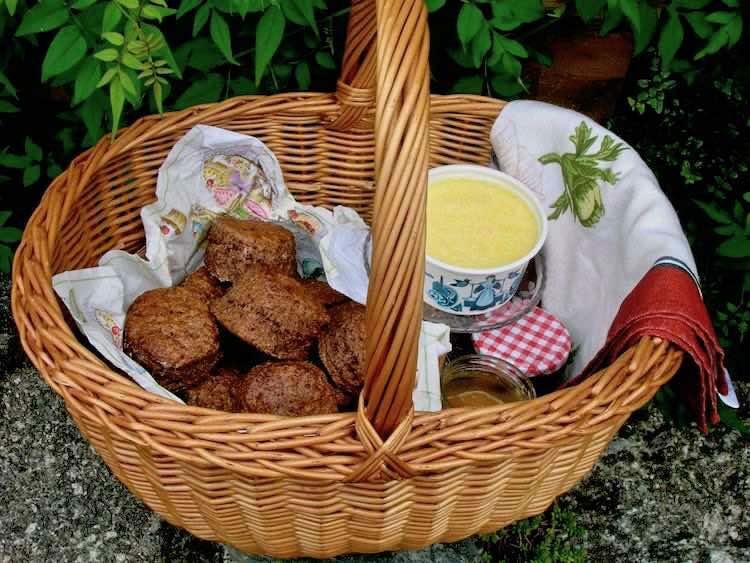 If you ever need a scone recipe, Celia’s annual round-ups of all sorts of scones from bloggers around the world is a must. Read on to get the recipe for my rich dark chocolate scones. It’s that time of year again! 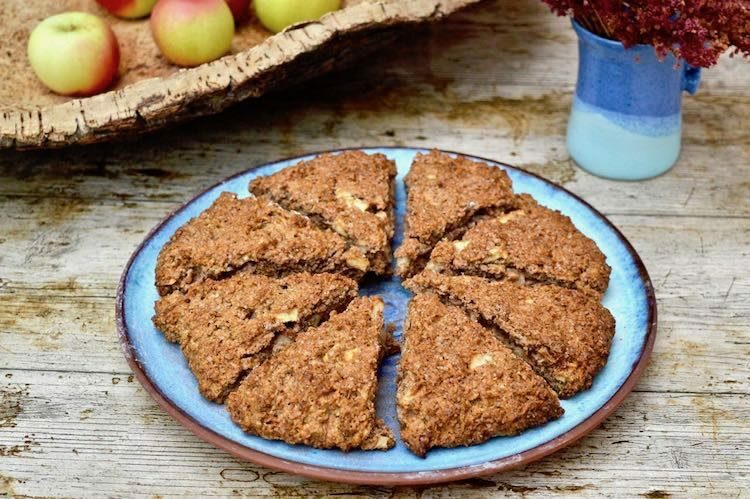 Yes, it’s International Scone Week over at Fig Jam and Lime Cordial – only it seems to have morphed into International Scone Fortnight this year! Actually, it looks like I’ve missed the boat and the round-up is already posted. Do check it out as there are a number of very different and delicious scones to admire. I’ve always had a bit of trouble with scones, but last year’s International Scone Week, galvanised me into action and I decided I was going to get to grips with making light and delicious scones once and for all. The resulting chocolate scones were perhaps not the lightest ever, but they were still at the upper end of the scale of good and tasted delicious. Having just made curd tarts, I had rather a lot of whey left over, so the obvious thing to do with it was to make scones. I made these fabulous white chocolate scones earlier in the year so I used similar quantities, only this time without butter and whey rather than sour milk. I crossed my fingers that they worked out OK.
Sieved 8oz flour (2oz wholemeal, 6oz white) into a bowl with 1 tsp cream of tarter and 1/2 tsp of bicarb of soda. Added the chocolate and gave a good stir. Made a well in the centre and added 1/4 pt of whey. Brought mixture together with my hands handling it as little as possible. Rolled it out to about 3/4 ” and cut into 9 rounds. placed on a lined baking sheet and brushed with whey. Baked at 185C for 15 minutes. Those crossed fingers seemed to do the trick: the scones were delightful, light, but moist with a nice hint of vanilla from the chocolate. They were so simple to make too, not rubbing butter into flour, which for some reason I particularly dislike. They went remarkably well with some of my mother’s homemade blackcurrant jam and a good dollop of Cornish clotted cream. So far these are probably my most unusual scones and cause some surprise which soon turns to ecstasy when they are tasted. Preferably warm from the oven they must be eaten with black cherry jam and lashings of clotted cream – a chocoholic’s delight! Well it took me a while, but I did eventually get around to making them and coincidentally just in time for Celia’s International Scone Week. I didn’t exactly follow the recipe and used watered down yogurt rather than milk and lemon juice. But the saddest omission was failing to use cherry jam to top the scones, I didn’t have any to hand, so Black Forest would have been a misnomer. Put 8oz flour (half spelt, half white), 1.5 oz cocoa powder, 1.5 tsp baking powder and a pinch of salt into a large bowl. Added 2oz unsalted butter and cut this into pieces with a knife. Rubbed the butter into the flour until the mixture resembled breadcrumbs. Stirred in 3oz vanilla (granulated) sugar. Broke a duck egg into a measuring jug and topped up to 1/4 pt with a mixture of half yogurt / half water. Stirred into the dry ingredients then brought the mixture together with my hands. Rolled out on a floured surface to 3/4″ thick and cut into eight 2″ rounds. Placed onto a lined baking tin, brushed the tops with milk and baked for 20 minutes at 190C. Jane warned that if these scones were too sticky, they would not rise and that extra flour may need to be added. Did I heed her? No. My scones did not rise as much as I’d hoped and they were a little moister than they should have been, but who likes dry scones anyway? And, more importantly, they tasted delicious, especially topped with lashings of clotted cream. I shall have to make these again when I have some cherry jam as I really don’t care to miss out on the ecstatic experience Jane describes. I will of course apply the jam first -tis the true Cornish way.